Transocean Services AS, a wholly owned subsidiary of Transocean Ltd. (NYSE: RIG) (SIX: RIGN), announced an all cash voluntary offer for 100 percent of the shares of Aker Drilling ASA for NOK 26.50 per share. The Board of Directors of Aker Drilling has unanimously recommended that its shareholders accept the Offer. On August 14, 2011, Transocean entered into an irrevocable agreement with Aker Capital AS to acquire 41 percent of the outstanding shares of Aker Drilling through (a) the purchase of 14,959,740 shares by an affiliate of Transocean, representing 4.99 percent of the outstanding shares, and (b) a pre-commitment agreement for the remaining 107,873,858 shares, representing 36.1 percent of the outstanding shares, to be purchased by Transocean pursuant to the Offer. In addition, Transocean has received irrevocable pre-commitments of 19.5 percent of the outstanding shares of Aker Drilling from other shareholders, including funds managed by TPG-Axon Capital, bringing the total irrevocable commitments to 60.5 percent of the Aker Drilling outstanding shares. The Offer price indicates an equity market capitalization of approximately NOK 7.93 billion, or $1.43 billion, assuming an exchange rate of NOK 5.53 to USD 1.00, which represents a 62 percent premium to Aker Drilling's 30-day average price of NOK 16.39 per share. Additionally, Aker Drilling has net debt of $0.80 billion. Aker Drilling operates two harsh environment, ultra-deepwater, sixth-generation semi-submersible rigs currently on long-term contract to Statoil and Det Norske in Norway. In 2013, Aker Drilling is expected to take delivery of two sixth-generation drillships currently under construction at the DSME shipyard in Korea. The payment obligation when the drillships are delivered is $0.90 billion. Aker Drilling will contribute approximately $1.05 billion in firm contract backlog. The transaction is also expected to be immediately accretive to Transocean's earnings. 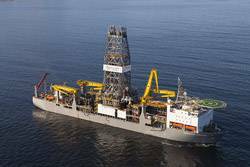 Steven Newman, President and Chief Executive Officer of Transocean Ltd., said, "Aker Drilling is an excellent strategic fit for Transocean. It allows us to enhance our position in Norway where we have enjoyed a long-term presence and excellent customer relationships. Aker Drilling's high-quality people and state-of-the-art offshore drilling fleet will ensure that we continue to deliver outstanding service to our customers. This transaction also demonstrates our commitment to enhancing shareholder value by continuing to invest in high-specification assets to drive long-term growth."